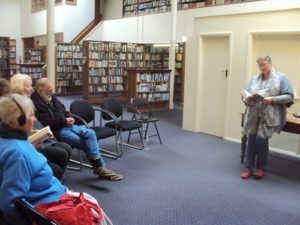 When we decided to give doing weekly readings a go I imagined that people would come, listen to the reading and then leave but something interesting has started to happen. Everyone goes into a sort of reverie while the reading takes place (included the person doing the reading) and when it is over we all take a deep breath and then start talking about what we have heard. In fact the conversations afterwards take longer than the reading and have been very interesting. It really deepens the experience. As the person who will be doing the bulk of the reading I was a little apprehensive but I am finding that Janet Frame’s writing is so lyrical that I loose my performing nerves and just get lost in the enjoyment of it.